This is Tot, the "trusty sidekick" of the Wacky Pack gang. That's nice you say? But, why should you care? 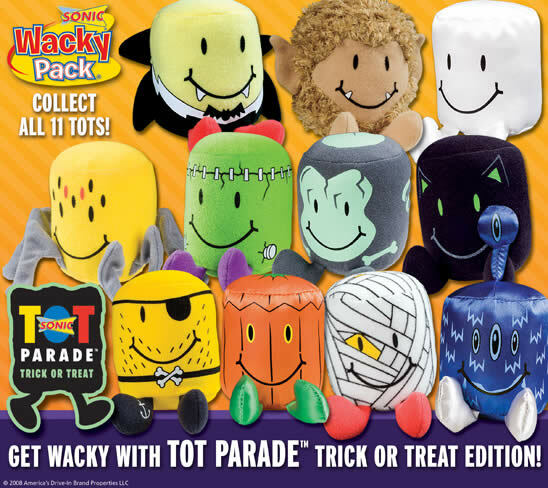 Because apparently every year there is a Tot Parade! For 2011, he's dressed up as Dino Tots and I'll admit it, these guys made me smile. I can't help it, they're smiling at me! Had my son not been sleeping, I'm positive he would have wanted one of these. 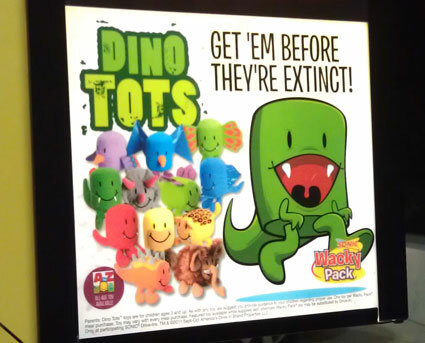 The collection includes Raptor Tot, Cave Tot, T-Rex Tot, Stego Tot, Ptotodactyl Tot, Frilled Raptor Tot, Ankylosaurus Tot, Saber-toothed Tot, Archaeopteryx Tot, Spinosaurus Tot, and Triceratot. However, it was late so we grabbed our ice cream and headed out. Now if Sonic wasn't over an hour away from our home, I could totally see stopping once a week to work on this collection. 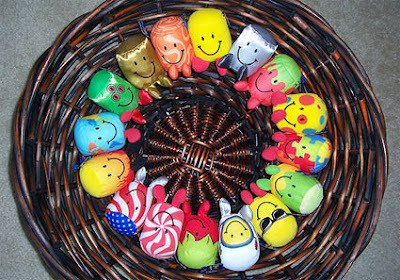 In a world of cheap plastic kids toys, it's neat to see a little stuffed animals. Now, if you are still interested, here's a little history. 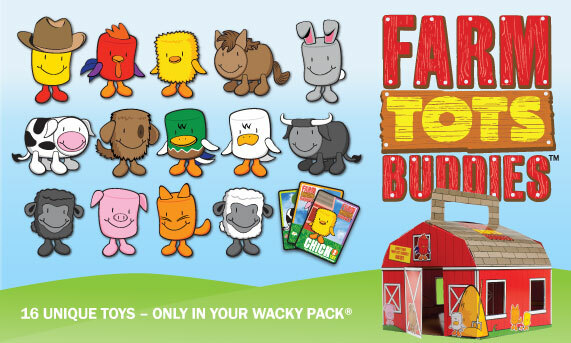 The 2009 Zoo Tots Collection (photo courtesy of Kids Meal Wiki). This one is a partnership with the Association of Zoos & Aquariums. Ha, the website listed still works! 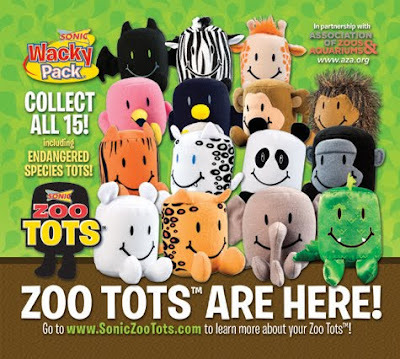 Head over to www.soniczootots.com (taken down) to learn more about each of the 15 animals you see above!! You (and/or the kids) can play as the bat, zebra, giraffe, flamingo, penguin, monkey, porcupine, tiger, snow leopard, panda, gorilla, polar bear, leopard, elephand or crocodile. Ok, that ends my story. My wife thought I should ask if I could buy the tots seperately, but they were so busy, and we were so tired that I didn't have the nerve to ask (ok, I was too shy to ask). Anyway, check these out if you get a chance, I'm guessing the kids will get a kick out of them. Ok, I will post about our tasty sonic shakes a little bit later. SONIC IN DFW AREA IN TEXAS WILL SELL THE TOTS FOR $1 EACH .. WE EVEN HAD LARGE DALLAS COWBOYS TOTS!! My daughter has almost all of the Halloween tots and all of the Deep Sea tots and is now working on getting all of the Dino tots. She wishes they would re-release the Zoo tots so she could collect them too... This represents a LOT of grilled cheese and tater tot kids' meals!